This summer I had the privilege to admire some very famous works of art in person. Michelangelo's David was definitely one of the more iconic. Turning the corner into the gallery, it was pretty hard to miss the 14-foot, shiny marble human figure, even from a distance: it was big, it was polished, it was impressively executed. But it was actually walking through the room leading up to David and pausing at each of Michelangelo's unfinished sculptures that revealed something even more inspiring. 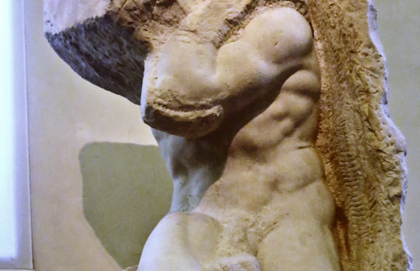 Aside from the fact that the incomplete state of these sculptures made for some very interesting metamorphic, man-emerging-from-stone subject matter, what struck me was how much more I sensed of Michelangelo as a person through these works than through the picturesque David. I was given a taste of the process he used for shaping a slab of marble into a human figure, plus I could see every individual mark made hundreds of years ago by the chisel he held in his very skilled, but very human, hands. It was as if he had offered me a glimpse, albeit unintentionally, into his mind and his handwork with these unfinished and imperfect pieces. In contemporary art, I find some of the most highly technical paintings or perfectly exhibited pieces can put up a blockade between the viewer and the artist. These pieces can encourage the view that art is inaccessible and unapproachable to the everyday viewer, rather than engaging and relatable. This causes me to wonder if, instead of fostering the idea that art can only be appreciated by well-seasoned critics, artists could be more generous by intentionally revealing some of the process within their pieces. Instead of perpetuating the view that fine art can only be valuable to expert historians, could art be more universally invitational if a viewer is privy to the piece's imperfections? Perhaps this transparency of process could be valuable in our context today. It may be a way to take art from its perceived unreachable position in pristine galleries and bring it to the level of the viewer. Outside the world of aesthetics, I am discovering a relatable and invitational pull from the city in which I live. I am new to the city of Hamilton, and I haven't lived in the downtown area before, let alone that of a city as gritty as this one. I encounter glimpses of hope and renewal springing up in the areas which I have been told were once completely dilapidated. I also see situations of hopelessness—evidence of how bad things used to be, and in some cases, still are. Through some guided walks and conversations, I have been made aware of how even some of the revitalization and renewal has the potential to create other areas of despair and displacement: for instance, the new GO Station will connect Toronto with another area of Hamilton. What will the effects be? Either way you look at it, this city, I would suggest, is an incomplete work. A quick walk downtown beckons me to engage in the "unfinished," whether in conversation, during cultural happenings, in beautification, or with the unknown or marginalized. This invitational approach may also be translated into the context of Cardus*U. As we the participants explore and test out ideas at Cardus, the staff here is intentionally open about their own projects, ideas, and processes with us. In an environment of learning, this fosters a rich collaboration and encouragement to be involved—more than a presentation of a finished, polished, or predetermined product ever could. I wouldn't argue against the fact that a well-executed project—whether an impressive marble sculpture or city-renewing vision—is inherently valuable, but I hope that we can model a relational and invitational approach with each other. As we share our accomplishments, we can also be mindful of the imperfect yet important process of our participation in the not-yet complete work of the Kingdom. Janice Tolkamp is a Cardus U Participant in the 2014-15 Cohort.